The Centers for Disease Control and Prevention have released a new, free resource intended to help dental healthcare personnel prevent causing and spreading infections. 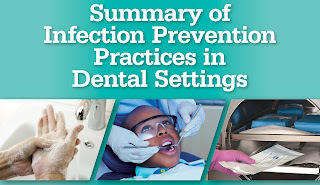 The comprehensive summary guide is titled "Summary of Infection Prevention Practices in Dental Settings: Basic Expectations for Safe Care." It features several new tools that should help personnel understand and follow infection prevention guidelines. Provides basic infection prevention principles and recommendations for dental healthcare settings. Reaffirms Standard Precautions as the foundation for preventing transmission of infectious agents during patient care in all dental healthcare settings. Infection Control Consulting Services (ICCS) has extensive experience in dental infection control practices. Services range from development of a customized infection control manual, on-site visits with a comprehensive written report, and assistance with monitoring practices including those of cleaning, disinfection and sterilization. Contact ICCS today to learn what we can do for your practice.